In 1837, Bunker Hill was founded in Macoupin County, Ill. Like many small communities, Bunker Hill provides its 1,700 residents with utilities and services, including collection and treatment of wastewater. For the last 50 years, Bunker Hill’s wastewater treatment system consisted of sewer piping, lift stations, three non-aerated lagoons, a rock filter and disinfection. Having outlasted its intended lifespan, this collection and treatment system required updating to meet more stringent effluent requirements. With only a limited budget on hand, the city applied for U.S. Department of Agriculture Rural Development assistance for procurement and implementation of new equipment. The city was awarded a $2.5 million low-interest-rate loan to address many of the problems the system was experiencing. Bunker Hill’s wastewater treatment system is permitted to treat 0.223 million gal per day on average, with an influent loading of 200 mg/L for biochemical oxygen demand (BOD) and total suspended solids (TSS) concentrations. The Illinois Environmental Protection Agency updated the city’s existing permit to include an ammonia effluent limit of 1.5 mg/L in the summer and 4 mg/L during the winter. BOD and TSS permitted effluent treatment requirements remain unchanged at 25 mg/L and 30 mg/L, respectively. Jack Taylor, P.E., of Heneghan and Associates and Air Diffusion Systems (ADS) worked together in designing an updated system that included a five-year product and performance warranty to comply with the latest permit requirements. Collection improvements included repairing “grout in joints,” relining sections of sewer piping and the addition of new manholes. ADS recommended that Bunker Hill add an earthen berm to the existing primary lagoon to create two cells, one for storage and one for aeration. 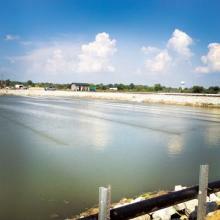 Fine-bubble aeration was added to three treatment lagoons and at the bottom of the rock filter. Additional upgrades and repairs were performed to the blower building, lift station and generators. For more than 50 years, ADS has been treating water and wastewater naturally by providing bottom “oxygen.” After discovering the benefits of using bottom laid fine-bubble aeration, J. Nelson Hinde of Hinde Eng. was one of the pioneers of the aerated facultative system. He engineered a process to improve wastewater treatment by restoring bottom oxygen levels capable of supporting aerobic organisms to convert unwanted wastes. ADS fine-bubble aeration is designed to provide optimal oxygenation and mixing without creating turbulence or re-suspending bottom sludge and sediment. It promotes the settling of solids and wastes to the bottom of the water column where they are internally stored and digested. When properly designed and implemented, media filters offer year-round reliable mitigation of nutrients including ammonia. The ADS aerated rock filter is a way to reduce nitrogenous compounds to below permitted levels. The system is designed for ease of maintenance, as the diffusers can be easily accessed and serviced within the rock. The aerated facultative lagoon systems and rock filters are designed for a 20-year service life when properly maintained. This aeration system also offers energy savings. The actual brake horsepower per person to run the blowers is less than 0.01 BHP. At 10 cents per kilowatt hour, each person pays less than two cents per day. 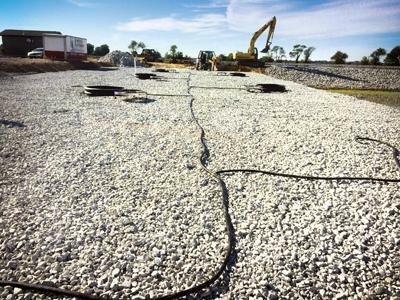 ADS installed over 25,000 ft of aeration tubing throughout Bunker Hill’s three treatment cells and the rock filter. Approximately 86,000 cu ft of limestone and river rock were incorporated into the final treatment cell. A baffle after the final aeration lagoon was included to cover the cell with a floating cover for algal and suspended solids reduction prior to the rock. The system has been maintaining the product and performance warranty for more than two years. The average effluent discharge for ammonia during the period from November 2014 to January 2016 was 1.08 mg/L. The average BOD and TSS discharge during these two years was reported at 2.98 mg/L and 9.58 mg/L, respectively. All outfalls have been reported to less than single digits since the aeration equipment has been added to the facility. 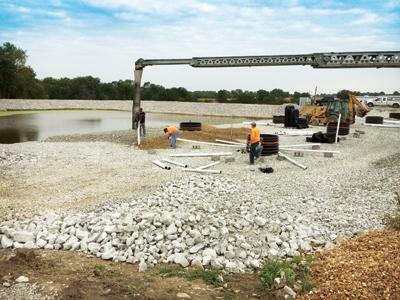 With communities across the country looking to meet minimal discharge concentrations without the expensive conversion to activated sludge, the aeration lagoon is a viable option. © 2018 Air Diffusion Systems. All rights reserved.